Let’s get behind the wheel of the 2016 Ford Focus RS. Whether you’re buying or selling a Ford Focus, you’ll want to know how your car measures up with similar vehicles in its range as well as against models of other brands. Some car buyers value luxury features while others value a solid safety package, and some are more concerned with price and fuel consumption. Whatever your connection to the selling and buying of the Ford Focus, we’re here to equip you with all the info you need to make smart decisions. Hop in and let’s see what we can find out. While the 2016 Ford Focus range has three distinct versions on offer, all share the same 1.5 litre turbo petrol ecoboost engine detailed in sections below. While the base-level Ambiente model is no longer available in the 2016 range, the Trend is now the cheapest entry making Ford less competitive with similar versions in the Volkswagen Golf range, which is almost a grand less. It’s almost more than $3,000 on top of the previous Trend model. The Trend: Options for the Hatch Manual at $23,390 or either the Hatch or Sedan Auto at $24,390. The Sport: Options for the Hatch Manual at $26, 490 or the Hatch Auto for $27,490. Titanium: Options for the Hatch or Sedan, both auto, at $32,690. ST: Options for the Hatch manual at $38,990. 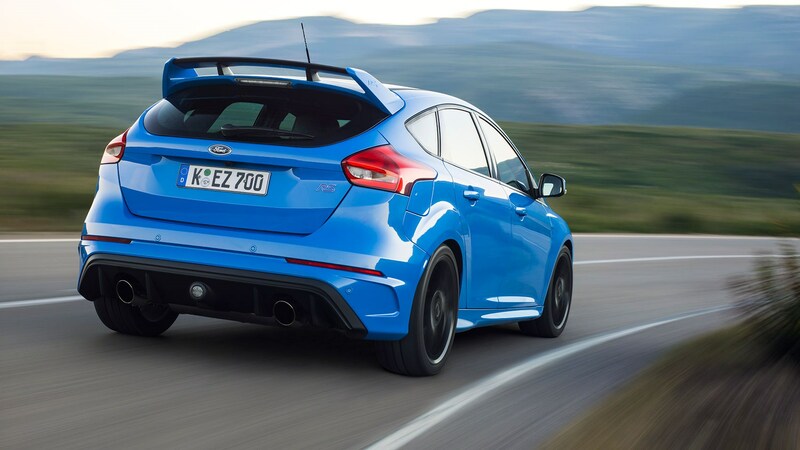 The Focus RS comes out at the top of the range with an initial cost of $50,990 which doesn’t include on road costs. You can opt for the 19-inch gloss black alloys and the Michelin Sport Cup tyres for an additional $2,500. While this might seem like quite a leap from the ST version below, it’s actually $9,000 than the RS in the previous run. If you’re not into the base colour, white, then you’ll need to tack on an extra $450 to get the Shadow Black, Nitrous Blue, or Magnetic Grey. What makes this cost of the RS attractive is it’s comparison to competitors with similar output and features. While it may not have the same flashy connotations as Audi, Mercedes, and BMW, it knocks off as little as $12,000 and as much as $27,000 when looking at models with similar specs. There is reason that the Ford Focus RS sits at the top of the price mark for the Focus range. Not only has it switched from front to all-wheel-drive, but the engine (detailed below) is much punchier and sportier. Two-thirds of the torque is sent to the back-wheels as part of the electronic all-wheel-drive monitoring system that updates almost twice a second, so this vehicle can handle some serious turns and quick maneuvering. It’s pretty clear why this is considered a performance vehicle, along with the Fiesta and Focus ST, the Falcons XR6 and XR8, and the Mustang V8. What’s the experience like on the inside? Well you’ve got voice control allowing you to change climate, media, phone calls, and even navigation without moving a finger. You can also leave keys in your pocket with keyless entry and push button start. There is an 8-inch high-res colour touch screen if you like doing thing manually, and driver and passengers alike can enjoy the 9-speaker sound system that corresponds to bluetooth as well as USB and RCA inputs. Function definitely doesn’t mean skimping on style though as you’ll have 19-inch alloy wheels, a special body kit and fascia made just for the RS, and Recaro shell seats with partial leather interior. The impressive 2.3L 257kW/440nM ecoboost four-cylinder turbo engine puts it above competitive models Volkswagen Golf R and Mercedes Benz A45 AMG that top out at 206 kW and 265kW respectively. Acceleration from 0-100km is 4.7 seconds, not too shabby. The amount of torque means only manual transmission will be available for the RS, which contains a 6-speed manual gearbox, staying true to the more classic manual designs. The Focus RS also has a new and unique “drift mode” that allows drivers to oversteer without losing control, for a bit of fun. Professional rally driver Ken Block made the RS famous for this whirling drift mode by sending it into sliding circles, smoke pouring from the tyres. You don’t need to pull any stunts like this but it’s cool to tell people that you can. While we often think of sports cars as having tiny little compartments we have to squish ourselves into, let’s not forget that the RS is still a hatchback. We’ve got five doors and about 260 litres of cargo space. That isn’t too bad but it’s almost 60 L less than earlier models. If you’re not too tall, you’ll enjoy the comfy seats, but you won’t get any vertical adjustment in this car. This is probably the biggest area lacking in the Focus RS (other than the gigantic 11.8 metre turning radius). It unfortunately does not have AEB, rear cross traffic monitoring, lane keep and lane departure assistance or auto high beam headlamps. It does have rear view cameras and six airbags as well as the SYNC2 system that connects to emergency services but these would seem to be the very basics when it comes to some safety packages. Ford claim that combined consumption is around 7.7L per 100kM but several independent tests found it to be much higher, especially if you’re doing donuts in the carpark. 3 years and 100,000kms basic warranty. Pros: Well priced and extremely powerful. Cons: Lacking in safety features, huge turning radius, and very stiff tracking.